A Grateful Dead founding member collaborates beautifully with Josh Ritter and the National on his first album of all original material in 30 years. Despite the fact that he was a consistent member of one of rock’s most popular and enduring bands in the ‘60s, ‘70s, ‘80s and beyond, Bob Weir is enjoying an unusual and unique kind of revival and reevaluation in our current decade. In 2014, the excellent Netflix documentary The Other One did what few -- if any -- Grateful Dead-related retrospectives have done in the past: shifted the focus of the band’s history from late vocalist/lead guitarist Jerry Garcia to vocalist/rhythm guitarist Weir. The latter was not only the rugged-voiced rocker yin to Garcia’s bearded yang; he often stood in Jerry’s looming shadow, deprived of a lot of adulation his bandmate was given throughout his career and even decades after his passing. Besides the aforementioned documentary, Weir has also worked with indie/folksters the National, self-confessed Deadheads who not only collaborated with Weir on one-off gigs, but also curated Day of the Dead, a lovingly assembled multi-disc Grateful Dead tribute album released earlier this year (with Weir’s blessing and participation). Now comes Blue Mountain, Weir’s first album of entirely original material in 30 years. Not only has he enlisted the help of National members Aaron and Bryce Dessner and Scott Devendorf, he has the songwriting secret weapon of Josh Ritter working with him on the songs. This is impressive firepower. Self-touted long before its release as Weir’s “cowboy album", the description is not too surprising for longtime Weir fans. For me, the two most distinctive examples of Weir donning musical cowboy garb are “Mexicali Blues", the infectious, horn-spiked Tex-Mex number from his 1972 debut solo album, and the Dead’s exquisite cover of Marty Robbins’ “El Paso". But neither of these examples prepares the listener for what’s on Blue Mountain. There are no upbeat mariachi numbers, nor are there any covers. 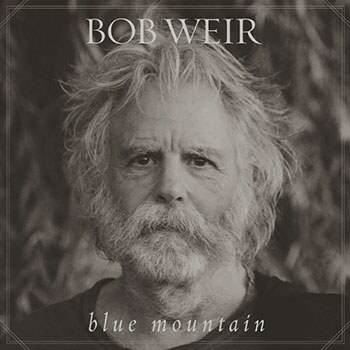 The focus is on a loose, largely acoustic feel, and the songs tend to draw on Weir’s earlier experiences working on a Wyoming ranch as a teenager. There’s also tales of loss, heartbreak and mortality living comfortably alongside all the journeyman references to Jackson Hole, the Cumberland Gap and the Rio Grande. “Only a River” opens the album and sets the tone immediately with its deep, cavernous sound and simple strumming. “Only a river gonna make things right,” Weir repeats throughout the choruses like a mantra, while sparse electric guitar licks spike the arrangement. As on the rest of the album, Weir wraps his husky, world-weary baritone around the words with a combination of loss, regret and perseverance. Weir’s voice is still a rough-hewn instrument, and he’s never sounded better than when singing top-shelf material like “Whatever Happened to Rose", a lovely waltz-tempo ballad of bottomless sadness. Weir’s deep emotional connection to the material is palpable as he shifts from humming to crooning to near-torch song belting on the gorgeous tale of heartbreak and loss. One of the more blatant examples of Weir fulfilling his promise of going all cowboy on us is “Gonesville", a delightful, melodic number that gallops along on an easy groove. The band jams nicely and unpretentiously, keeping things simple and twangy, while Weir’s vocals get a bright reverb treatment. There are only a few times when Blue Mountain seems to lose its way -- “Ki-Yi Bossie” is an overlong, casual campfire sing-along that gets an almost campy run-through. I’m sure that’s the point, but the song pales in comparison to the rich, masterful arrangements of the album’s better songs. On the other hand, “Storm Country” takes an entirely different tack with an abstract, indie structure, sinking into a rabbit hole of odd vocal phrasing. Both of these songs miss the mark but are only mild diversions from an otherwise gorgeous album. “I was born in a manger in Texas,” Weir croons on the beautiful title track, accompanied only by acoustic guitar. Sure, it’s a strictly fictional tale from a guy who was actually born and raised in an affluent San Francisco suburb, but it appropriately sets the scene for this welcome new collection of songs from a living legend closing in on 70 with no apparent desire to pack it in.